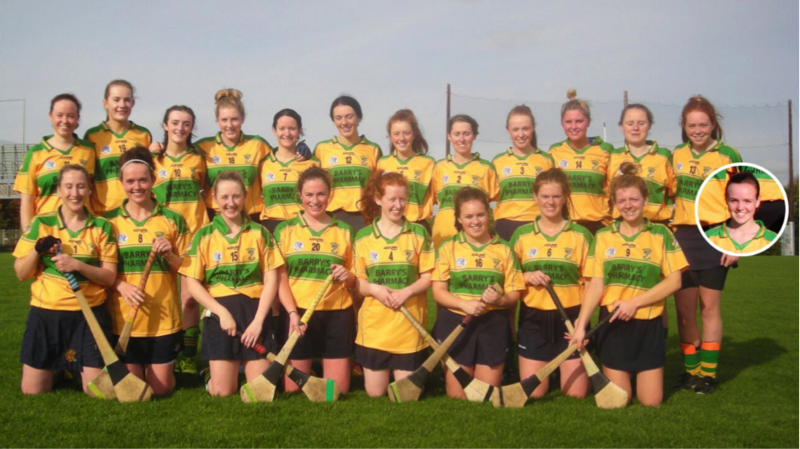 It’s been a truly remarkable achievement for this Senior Camogie team. In late August, the team won the Senior 3 league and will now play at Senior 2 in the 2016 season. During the summer months, they played in the Senior 1-3 Summer Cup and beat senior 1 and 2 teams convincingly only to fall in the last hurdle when Lucan A beat them in the final. However, the team reset their sights on the championship and eased through the group stages of the competition, beat St Oliver Plunketts ER in the semi-final and overcame Nh Padraig in the final with a powerful display. The foundation of the success in the final was built by the six backs and goalkeeper, Melissa Burgess. The full back line of Siobhan Heavey, Julie O’Keeffe and Claire Barry kept an extremely tight ship for the 60 minutes and repelled any loose ball that came their way while the strong and very mobile halfback line of Isabelle Costelloe, Megan Lewis and Yvonne Twomey never let one ball through their line all day. The story of the midfield and forwards can be read in the “WeAreDublin” report below. 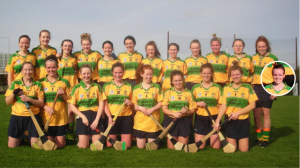 Back Row: Olivia Rush, Roisin Mullen, Frances McCann, Olivia Courtney, Yvonne Twomey, Saoirse Malin, Isabelle Costelloe, Siobhan Heavey (capt), Julie O’Keeffe, Kate Holland, Eimear Mullen, Kerrie Finnegan, Cora Hogan (inset). Front Row: Melissa Burgess, Georgina Kelly, Caoileann O’Connor, Hannah Gleeson, Claire Barry, Georgina Pickard, Megan Lewis, Catherina Costelloe. Faughs Celtic gave an utterly dominant display yesterday in O’Toole Park against Naomh Padraig to lift the We Are Dublin Senior 4 Championship Title. They led from start to finish as they over ran Naomh Padraig on the way to an eighteen point one sided victory. You had to feel sorry for Padraig’s who just never got going and came up against a side that were in excellent form. The platform for Faughs victory was the brilliant and dominant display in midfield of Catherine Costello and Player Of The Match Georgina Kelly. Both players were just unplayable yesterday and the passing from Georgina Kelly was top drawer as she found her forward colleagues with pinpoint accuracy. The writing was on the wall early on for Naomh Padraig as Faughs slick hurling had them on the back front from the off. The constant one way traffic left the Padraig’s back line and midfield at sixes and sevens as Faughs attacked from all over the pitch. The first three scores of the game came from the hurl of Georgina Kelly, the first from a free was quickly followed by a well struck 45 and a brilliant finish from open play. Such was Faughs dominance Padraig’s only managed two points in the first half, two frees from Niamh Gaff. At the other end they conceded a massive 1-09. Midfielder Catherine Costelloe helped herself to three points, two from frees and the other from a 45, and they were followed by two excellent points from play Olivia Rush. Saoirse Malin got her first of two points shortly afterwards and the impressive Kerry Finnegan scored a brilliant point after some quick skillful interplay. Georgina Kelly hit her fourth point of the half before the games first goal was scored by full forward Kate Holland who finished a well worked move that started in midfield. A Costello free finished the scoring for the first thirty minutes and at the break Faughs were ahead by twelve points with the score 1-11 to 0-02. Naomh Padraig to their credit battled till the end, but they just couldn’t stem the flow of the one way traffic. Francis McCann got the first score of the second half as Faughs pressed for home. The movement and interplay of Francis McCann, Olivia Rush, Saoirse Malin, Kerry Finnegan, Kate Holland and Caoileann O’Connor made life extremely difficult for Naomh Padraig’s back line of Isobel Kane, Helena O’Connell, Niamh Doran, Ciara Gaff, Lisa Fogarty and Sarah Brown who deserve great credit for never giving up on what was a lost cause. Further points for Faughs from Malin and Finnegan from open play and a well struck free from Costelloe had the engravers inscribing the Faughs Celtic name on the trophy with fifteen minutes still left in the game. But the plucky ladies from Naomh Padraig were not yet done and dusted and worked the ball into the scoring zone where substitute Denise Mullins finished the move to the back of the Faughs net and the player turned to her teammates and let a defiant roar. Unfortunately it didn’t inspire a comeback as they failed to score for the rest of the second half. Faughs Georgina Kelly gave the large support in O’Toole Park two pieces of magic in the second half and was unlucky to not get full return for her skill. She hit two sideline cuts in quick succession from acute angles on the righthand side of the pitch towards goal, the first came crashing back off the crossbar and the second one narrowly went wide of the left hand post. She deserved better for her two fantastic efforts. Before the end Naomh Padraig were hit with a further five points, one each for Olivia Rush and Francis McCann and three in a row from Catherine Costelloe, two from frees and a stunning point from play and Faughs were crowned Senior 4 Champions after a scintillating display of slick, clever and dominant hurling.